Perhaps this quote from a Fangoria interview with author Chuck Palahniuk should preface every novel of his, as a way to explain what the reader is about to discover. One of the things I wanted to ask Chuck Palahniuk during the question & answer session held after a reading of his new story ‘Boogeyman’ was if he held any fear towards death. This wasn’t an accusatory question, that his life of writing provocative scenarios in his eleven-novel career would somehow earn him a REASON to fear death. This is an honest confession, one allowed to pass by the mask I wear writing this – I am scared of death. It’s not the process but the fear of no longer existing, of no longer having a mind or having some kind of way of interacting with people. I’m not sure if there’s either a heaven or hell but if I could pick, I’d spend eternity in the McKittrick Hotel with Calloway played by William Popp. 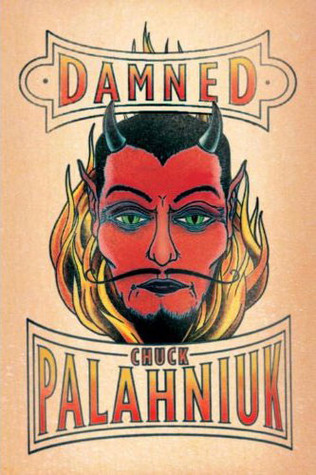 The subject of Palahniuk’s latest novel, Damned, deals with the concept of heaven and hell. Writing about the afterlife is a safe way to assuage the fear in the greatest of unknowns, about what happens to someone after they die. Not so much the body but the brain and the concept of the soul. In Damned, the soul of a thirteen-year-old girl is condemned to Hell. The first of a planned trilogy, Damned follows Madison Spencer as she experiences Hell firsthand. Comparing it as a demented Judy Bloom novel (each chapter opens up with “Dear Satan. It’s me, Madison.”) the novel aims to offer a perspective on living, dying and being damned through the eyes of a pubescent girl. That’s a bold undertaking for a fifty-year old man. I don’t remember what I sounded like when I was thirteen and I’m much closer to that age than Palahniuk is. Setting the narrator as a young girl is a crazy move and there are some times when the illusion fails and it becomes less Madison’s story and more Chuck’s. The book falls apart in many places, which might be reflective of Palahniuk trying to do too much in too short of a time. He’s an ambitious writer, and some of his ambition pays off. Damned has some really strong concepts and some really potent writing. The chapter where Madison, daughter of a famous movie starlet and a wealthy businessman, finds herself abandoned over the winter break in her boarding school stands out as one that demonstrates Palahniuk’s talents as a writer. The scene is well crafted through the style that made such novels as Fight Club, Choke and Invisible Monsters highly enjoyable to read. In addition, this chapter of this girl experiencing life as a ghost while still alive (foreshadowing!) is probably the strongest, emotionally, throughout the book. There are plenty other areas in the book for emotional value to be mined. Palahniuk proposes that demons in Hell are the disposed gods of old, that there’s a potential that Jesus would eventually be cast down into this Inferno. This rich supply of potential characters is a ripe crop of personalities but of those who appear, demons are presented as nothing more than bored government workers. The interpersonal relationships between Madison and the characters she comes in contact with are never really developed. There are some hints, but it all seems very superficial as Chuck tries to get everything in before the story runs out. There are two more books scheduled in this world, one of which might be finishing up right now. ‘Damned’ came out in 2011, written during a 2008 period that was tumultuous to Palahniuk’s life. His father’s killer was removed from death row due to a case review and his mother was diagnosed with cancer. This book seems the product of therapy and much like therapy, breakthroughs and revelations come with messy exploration and a lot of directionless effort that seems, at first, a good way to go but end up wasted. It’s a book that goes by fast and has some positives. It has a lot of flaws. It won’t be the book that makes a new fan of Palahniuk but if you want to see where his head is at (and where you soul is going) you should give it a read.